The ruling and main opposition parties on Thursday reached an agreement to pass a revised bill on the government’s 2019 budget despite opposition from minor parties. The governing Democratic Party (DP) and the main opposition Liberty Korea Party (LKP) agreed to cut more than 5 trillion won from the government’s record 470.5 trillion-won (US$426.6 billion) budget bill. 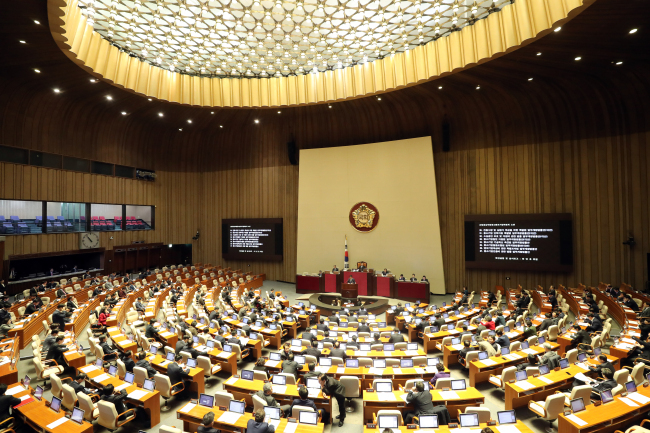 Major bones of contention in the original budget bill were an expected 4 trillion-won shortfall in tax revenue that stemmed from tax cuts and the budget set aside for inter-Korean projects and job creation. Under the agreement, they agreed to cut some spending on job creation and inter-Korean cooperation projects and reduce the number of newly hired public servants by some 3,000. Opposition parties took issue with 1.1 trillion won set aside for inter-Korean projects and a record 23.5 trillion won for job creation. The parties, meanwhile, decided to increase spending on measures to tackle the low birth rate and ways to build social infrastructure. Also, the parties said that the government will effectively fill the 4 trillion-won shortfall in tax revenue by repaying debt in advance within this year. For next year, state bond sales will be limited to 1.8 trillion won. But the agreement did not include electoral reform, a key sticking point in the budget negotiations, drawing condemnation from minor parties aspiring for the overhaul of the parliamentary election system. The minor opposition Bareunmirae Party and two minor parties have been seeking to link the issue to the passage of the budget bill, a proposal rejected by the DP and the LKP. They are strongly calling for the two major parties to accept their demand for a new proportional representation system. The minor parties are pushing for the introduction of a mixed-member proportional (MMP) representation system in which parliamentary seats are tied to the percentage of voters’ support for different parties. They vehemently opposed the bigger rivals’ agreement, denouncing it as political collusion to defend their vested rights. “The major parties’ greed for the vested interest trampled people‘s aspiration for political reform,” the parties said in a statement. This year’s budget review did not proceed smoothly amid partisan wrangling. The legal deadline for the bill’s passage expired Sunday. They agreed to vote on the budget bill during the last plenary gathering on Friday, two days ahead of the end of the parliament’s regular session. The floor leaders agreed to cancel a plenary session slated for Thursday with an aim at putting a revised budget bill and some 200 proposals altogether up for vote Friday. On Thursday, the National Assembly was supposed to open the session to handle hundreds of bills, including a proposal aimed at strengthening the punishment for drunk driving. A plenary meeting slated for Friday will be the last one before the 100-day parliamentary regular session ends Sunday.